We were outside earlier today enjoying the WONDERFUL mid 70s weather we're having. I knew I smelled a heavenly scent!!! 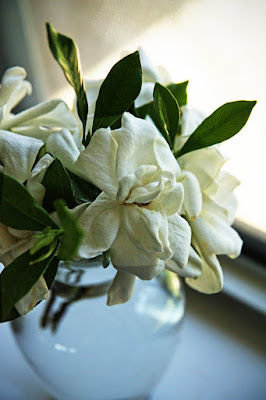 Sure enough, on the far end of the house, our gardenia bush is blooming again!! I LOVE when flowers surprise me by blooming unexpectantly!! Must be nice to have 70's weather. Florida won't have that for another 3 months or so. I bet they smell GLORIOUS!!!! Beautiful! Wish I had a sweet whiff!